Queens Park Rangers have sacked manager Steve McClaren following a run of one win in 15 Championship games. The 57-year-old, who was England boss between August 2006 and November 2007, was appointed in May 2018. Rangers have won just once in the league since 26 December and are 17th in the table, eight points above the relegation zone. McClaren's assistant John Eustace has been placed in interim charge while the west London club search for a new boss. "Making a decision such as this is never easy, particularly when you are talking about someone as professional and dedicated as Steve," chief executive Lee Hoos said in a statement on the club website. "It is well documented that we are in a period of transition as we work hard to make the club financially stable. McClaren, who won 16 of his 46 games in charge of the R's, had been working under financial restrictions at Loftus Road following the club's £42m settlement with the English Football League last summer for breaches of Financial Fair Play regulations during the 2013-14 season. The club only made two permanent signings last summer, bringing in defender Toni Leistner and veteran full-back Angel Rangel on free transfers, before signing thee players on season-long loan deals. The R's began the Championship season with four consecutive defeats but recovered during the autumn and, after beating Ipswich on Boxing Day, were two points off the play-off places. 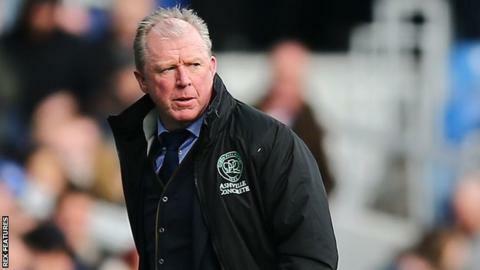 McClaren guided QPR to the fifth round of the FA Cup for the first time since 1997, but ultimately paid the price for their poor league form in 2019, with a seven-match losing streak in January and February seeing the Hoops slide down the table. "I would like to thank our fans for their patience and unwavering support during what has been a very difficult run of results, at a time when the club faces well-documented challenges," Rangers chairman Amit Bhatia said. "We must now work towards ending this season positively and building for the future." McClaren's departure from QPR adds a disappointing chapter to his varied managerial career, which has seen him take charge of five English clubs and two other sides in Europe. He won the League Cup in 2003-04 with Middlesbrough, who he then led to the Uefa Cup final in 2005-06, before leaving Teesside that summer to take charge of the national team. However, his spell with England only lasted 18 games and he left the role after England failed to qualify for Euro 2008 following a 3-2 defeat by Croatia at Wembley. He rebuilt his career in the Netherlands, guiding Twente to the Eredivisie title in 2009-10, and then became the first Englishman to manage in Germany's Bundesliga in 2010 - but was sacked by Wolfsburg in February 2011 with the club one point above the relegation zone. A short stint in charge of Nottingham Forest followed - he resigned after 112 days after three wins in 13 games - before he returned to Twente for a second time in 2012. He then had two spells in charge of Derby County, either side of time managing Newcastle United. McClaren lost a Championship play-off final with the Rams in 2014 and won just six of 28 Premier League games in charge of the Magpies during 2015-16 as the Tyneside club were relegated from the top flight. His second spell at Derby lasted five months and came to an end in March 2017, with the club 10 points adrift of the play-off places in the second tier.